+2: Target opponent exiles cards from the top of their library until they exile a nonland card. 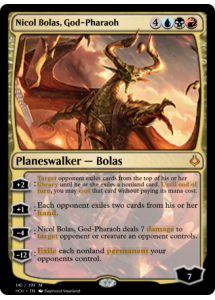 Until end of turn, you may cast that card without paying its mana cost. +1: Each opponent exiles two cards from their hand. 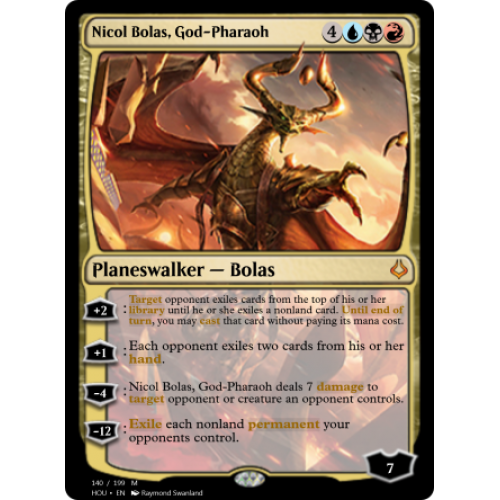 -4: Nicol Bolas, God-Pharaoh deals 7 damage to target opponent, creature an opponent controls, or planeswalker an opponent controls.